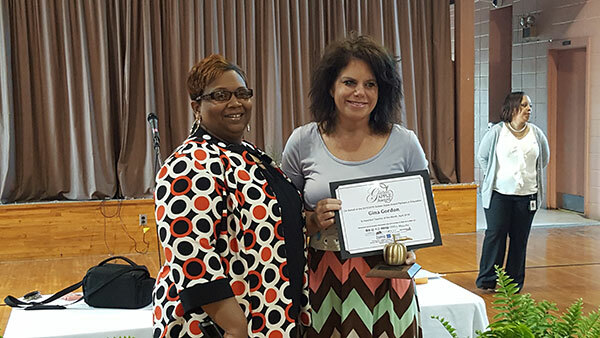 Having parents who believed in the importance of a good education was all the encouragement Newton Elementary School gifted teacher Gina Gordon needed when she chose teaching as her profession. Described as a dedicated, compassionate teacher by her peers and students, that portrayal was highlighted Monday when Gordon was named April's Golden Apple Teacher at a surprise ceremony at the school. "It's funny because when they were describing the winner, I had no idea it was me, so I kept looking around thinking of all the ones who deserved to win," Gordon said. "I just couldn't believe it when I heard my name, but I was so excited and my heart was filled with so much happiness." Newton Elementary School Principal Kay Killens said Gordon is a selfless educator. "Being the only gifted education teacher for the district, she has the monumental task of serving all gifted students, grades 2-8," Killens said. "She alone is responsible for instructing, planning and hosting competitions, scheduling trips and completing all the documentation that is required in this area. "Yet, she is always the first to volunteer when we have extra events on the campus," Killens said. "Her thoughtfulness in sharing reminders of staff birthdays, achievements, and leaving the uplifting handwritten notes of encouragement on desks, are some of the reasons we consider ourselves lucky to claim her as our own." Gordon said her parents, Clifton and Elizabeth Hollingsworth, taught her the importance of education at an early age. "When I was in fourth grade I wanted to teach because I thought teachers wore cute clothes," Gordon recalled, with a laugh. "But, through the years I wanted to teach for other reasons. My parents always encouraged me to get a good education. "At first I thought I could change the world, but after 22 years of teaching I know that God led me down that path," Gordon said. "I believe the children needed me, because not only did they need a good education, they needed a caring person in the classroom. They needed a teacher that would love and care for them, to be a mother, nurse, or just someone to be there for them." "For instance if I am having a bad day, something a child does or says can make all the difference," Gordon said. "One day a student looked up at me and told me she loved my voice. That just picked me up so much and the rest of my day was wonderful, because I kept thinking about what she said to me." Gordon's advice to new teachers: think of each student as an individual. "Forget what you have learned, and walk in the classroom and look at the child as an if they were your own," Gordon said. "Every child is a mother's baby, so treat that child as your own." Gordon said one of the highlights of teaching is knowing she makes a difference. "When the children I have taught through the years, come back to me as adults and tell me how much I inspired them, that makes it all worthwhile," Gordon said. "Some of them have even become doctors and lawyers." Students Ethan West, Cincere Price, and Daylen Ware all agree that Gordon deserved the award. "I was happy when she got the Golden Apple award," West said. "She is a really good teacher, she lets us draw pictures, and get on the computer and look at dinosaurs." "I was really surprised because I think she is a really good teacher, and for her to win is a really big honor," Price said. 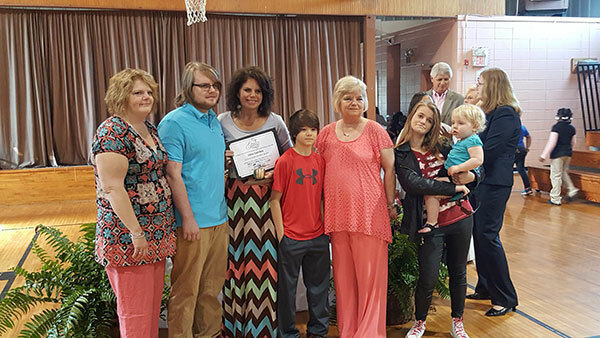 "She is the best teacher in the whole wide world," Ware said. Gordon's sisters, Tina McDearman and Kathy Sinclair, said their sibling is more to her students than just a teacher. "I'm very excited and happy for her, because I know how much of herself she gives to those students," McDearman said. "She is like a mama to them, giving them the love they need. 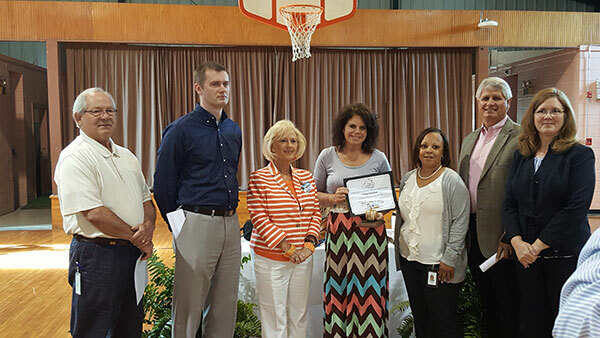 "She is really deserving of this award because she really works hard and cares about the children," Sinclair said. Gordon says even though retirement is on the horizon she has no plans to stop teaching just yet. "I will know in my heart when it is time," Gordon said. "As long as I feel these children need me, I'm not going anywhere." 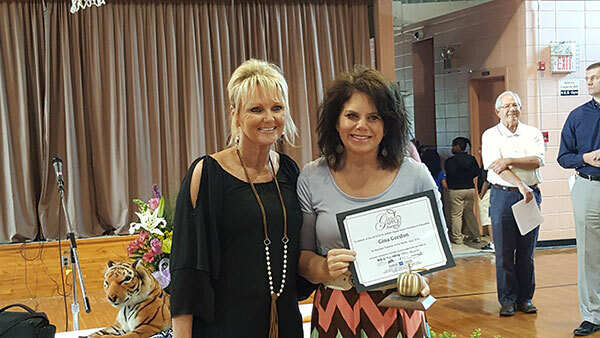 As a Golden Apple winner, Gordon will receive a $300 cash prize, a Golden Apple Trophy, a $150 donation to her "Adopt a Classroom' account and a large school supply donation for her classroom. The eight winners this school year will be invited to the Golden Apple Teacher of the Year banquet in May. That winner will again receive $2,500 cash to be used at their discretion and a $2,500 scholarship to be awarded to a deserving student in the teacher's name. CBS 24, NBC 30 and FOX 30 are the April Presenting Partners. The Golden Apple Award is open to any educator, grades kindergarten through 12th grade who works in Lauderdale, Neshoba, Kemper, Clarke, and Newton counties in Mississippi, or Choctaw and Sumter counties in Alabama. Presenting sponsor: Meridian Community College. Key Sponsors: East Mississippi Electric Power Association (EMEPA); Law offices of Richard Schwartz; Woodstock Furniture; The Meridian Star; Mississippi Power Company; La-Z-Boy; BOUNCE TV & COZI-TV; CBS 24, NBC 30 and FOX 30; Avery Products. Participating Sponsors: T & D Furniture; LaBiche Jewelers; Newell Paper Company; Meridian Coca-Cola Bottling Company; Southern Pipe & Supply; ESCO Corporation and John O'Neil Johnson Toyota.